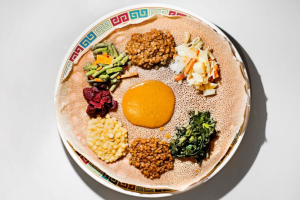 Teff Injera – an Ethiopian staple – Fresh Injera delivery to your door! As America embraces this ancient grain, teff can be found in gluten-free recipes for pancakes, breads, crepes or waffles and is showing up in products such as cereal, snacks, wraps and more. Nutrient-packed bran and germ make up the majority of the teff grain, which is why the nutrient content is so high compared with more common grains. Teff offers the most calcium (1 cup of cooked teff offers 123 milligrams, which is equivalent to half a cup of cooked spinach). And most grains don’t offer Vitamin C, but teff is an excellent source. Plus, according to the Whole Grains Council, teff is high in resistant starch, a newly discovered type of dietary fiber that can benefit blood-sugar management, weight control and colon health. This recipe is a spin on the standard veggie burger. Teff serves as a binding agent, and roasted sweet potatoes, black beans, oats, onions and scallions make up the rest of the dish. The burgers are loaded with Southwest flavor from fresh cilantro, lime juice, garlic, cumin, agave nectar and jalapeño pepper. They are baked (more healthful than pan-frying), making them slightly crisp on the outside and slightly moist inside. Serve the burgers with whole-wheat or gluten-free buns and your favorite toppings. They’re also great served on a salad or in a “lettuce sandwich.” Or simply dip them in guacamole. Gordon, a master of public health professional and a master certified health education specialist, is creator of the healthful recipe site EatingbyElaine.com. Find her on Twitter at @EatingbyElaine. It’s gluten-free, low-glycemic, and contains tons of minerals, fiber, and even a healthy dose of Vitamin Bs. Berbere is a mixture of Ethiopian pepper seasoned with garlic, ginger as well as many spices such as cloves, cumin seeds, and fenugreek seeds that are ground to a fine powder. Mitten Shiro is seasoned ground chickpeas used to make the Ethiopian Shiro dish. Ethiopia is known for the quality of its coffee beans. In fact, Arabica coffee, the finest of all coffee species, originated in Ethiopia.